Lisa Peng last saw her father at her seventh birthday party. In 2004, he tried to establish a safe haven for persecuted refugees in Thailand, where many Chinese refugees flee before heading elsewhere. But Peng said he was lured to Burma, where he was arrested by Chinese authorities and subsequently sentenced to life in prison and denied medical care for heart attacks, arthritis, malnutrition and kidney stones. Peng is one of an enormous number whose friends and family have faced political and religious persecution in China. 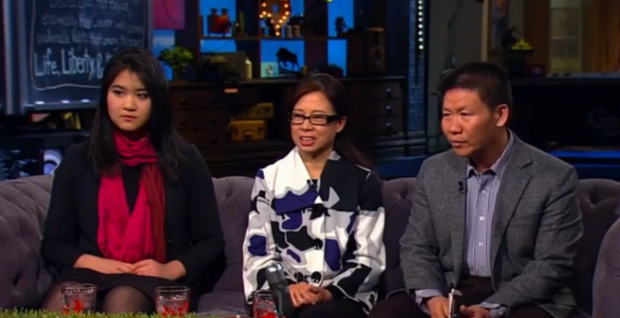 On Tuesday, Peng appeared on the Glenn Beck Program with husband-and-wife Bob and Heidi Fu, two other prominent Chinese refugees, to speak about the human rights crisis in China. Bob Fu is well-known for his work as president of ChinaAid, an international non-profit Christian human rights organization. He is also the author of God’s Double Agent: The True Story of a Chinese Christian’s Fight for Freedom. Heidi Fu described how — when her home in China was raided by the authorities — she palmed her small address book, filled with the names of hundreds of other Christians. If discovered, many of the contacts would likely end up in prison or the labor camps. As the authorities were searching her home, Heidi desperately tried to find a way to conceal the little booklet. Heidi was in prison for two months, but was able to sneak a message to her brother, who was arrested at the same time but released much sooner. He was able to retrieve the book before the authorities could search her house and find it. Many who have been targeted by the Chinese authorities aren’t just fighting for freedom in China, he argued, but for freedom worldwide in the 21st century. “If China is free it’s not only a blessing to the Chinese people, I think it will be a tremendous blessing, and (more safe) and peaceful place, (for) the whole world,” he said.